Whilst it’s true that wild garlic, also known as ramsons (Allium ursinum), is easy to identify, it’s important when foraging that you are 100% sure you know what you’re picking. Wild garlic could be mistaken for lily of the valley or cuckoo pint, both of which are poisonous. If it doesn’t smell strongly of garlic, don’t pick it. This webpage might prove useful. Before you go helping yourself, do make sure you’ve got permission to harvest from the landowner. I used my optimum 9200A Froothie power blender for this super quick no fuss wild garlic pesto. Once the wild garlic leaves are picked, washed and dried, it’s just a simple process of bunging everything into the blender and pressing a button. A food processor should be able to do the job too. You can, of course, use any nut you have to hand to make pesto and cheese is optional. I’ve made two batches so far and both were delicious. I went with the classic basil pesto ingredients of pine nuts, Parmesan and olive oil for my first attempt as I just happened to have them in the house. I know Parmesan Reggiano isn’t vegetarian, but there are various Parmesan type cheeses available that are suitable. The second batch, made a few days later for freezing, contained almonds and cheddar cheese. One of the best uses for pesto is, of course, pasta. I like to prepare some wholemeal pasta in the normal way and then throw in a few broccoli florets about 4-5 minutes before the pasta is ready. Once drained, I stir through a couple of spoons of pesto and hey presto, you have a very quick but delicious and nutritious meal. I’ve also been spreading it on toast and using it as a sandwich filling. I’ve a fab recipe for wild garlic cheese scones coming up soon too. Whether made with pine nuts or almonds, Parmesan or cheddar, this pesto is not only delicious, but a great way to use your foraged wild garlic. Out of season, basil, parsley, spinach or other soft greens can be used instead. Place everything in a blender or food processor and blitz until combined and you have the texture you like - I use my Optimum Blender. Spoon into small sterilised jars (I made 3 jars with this quantity). Top with a little olive oil and seal. Store in the fridge. If the pesto is topped with olive oil to help seal it, it should store in the fridge for a couple of weeks or so. You can also spoon into portion size moulds and freeze until needed. It's worth using a good quality olive oil for this. I’m sending my wild garlic pesto pasta to Jac at Tinned Tomatoes for Meat Free Mondays. Wild Garlic Pesto. PIN IT. I use the Optimum 9200A for smoothies, spreads, sauces and even chocolate making. The post contains affiliate links. Buying through a link will not cost you any more, but I will get a small commission. This helps keep Tin and Thyme blithe and blogging. Opinions are, as always, my own. I’ve made pesto dozens of times, with and without cheese, but have never thought of using cheddar! Duh! This looks fab, I need to get my hands on some wild garlic! You do Becca and soon too. They are already beginning to flower here. Hehe, yes indeed Nadia. I’ve never yet had a shop bought one I liked. Time you found yourself some wild garlic though. Wow that sounds amazing. 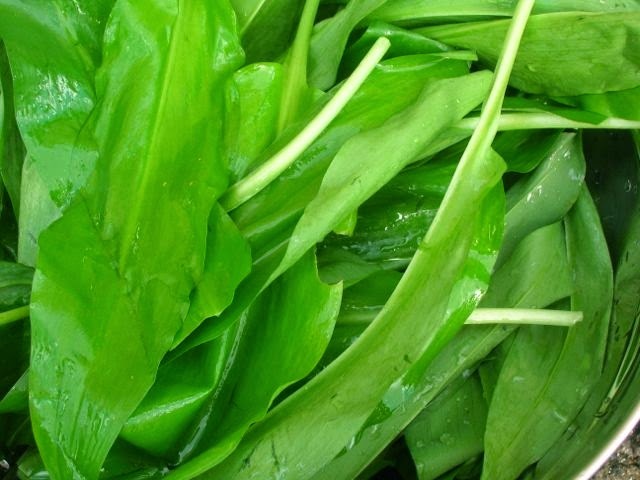 I’ve never tried wild garlic leaves – are they milder than using regular garlic? Got to try this! Yes milder than regular garlic, but they still have a bit of a kick. Yum!! Nothing better than a super fresh pesto! That pasta looks incredible! Oh yes Lucy, a pesto pizza could be amazing. You really need to get out there and do some foraging. The season will soon be over. I just like to make something that is quick, easy and delicious like your wild garlic pesto. To be honest, I don’t like to add too much garlic to food but your pesto looks so yummy, thanks Choclette for sharing! Pesto is just perfect for when you’re in a hurry or just can’t be bothered to do much. Although if you don’t like garlic, not sure how much you’d like this pesto. This is great, I have just made pesto myself in past dew days. So tasty! Once you’ve made pesto, it’s hard to go back to shop bought I’ve found. This pesto looks and sounds absolutely delicious! I love that you used wild garlic! Yum! At the moment, I can’t get enough of it Harriet, but expect I’ll be sick of it by the time the season is over – which will be very soon I reckon. Thanks Harriet. Our wild garlic is pretty much over now and it seems a long time to go until I can make some more. I love pesto but have never made it with wild garlic before! In fact, I’ve never made anything with wild garlic but I’d love to get my hands on some. Although there’s tons of it around our way, it’s actually quite hard to find any that’s away from busy roads and dogs. It’s great to have pesto to hand at pretty much any time Anna. It may not be quite as good as thoroughly fresh pesto, but it’s still heaps better than shop bought. I’ve never had wild garlic – I love the idea of foraging but would never quite trust myself to pick the right stuff…leaf identification is not my talent! Your pesto looks lovely – I could eat it by the spoonful! Well yes indeed CC, it’s always better to be safe than sorry where wild foods are concerned. I still can’t get enough of this pesto, it’s wonderful. looks so good. I love that you’ve frozen it into cubes and reminds me that I froze some whole leaves last year… must dig them out to see if they’re any good… we’re lucky up here in Lincs as our WG season seems to be slightly later than most and goes on for at least 3 weeks so I know I am sure to get some. There’s a hidden valley near by that reeks of the stuff. Good times! Oh good times indeed, although I find by the time they start reeking, they’re past their best. Would be interested to know how your frozen leaves turn out. Wonderful! I made this only once. Your version looks great! Thanks Alida. Why only once, didn’t you like it? I’ve been loving the arrival of wild garlic this year (although I confess….. I have been buying it from our local greengrocer rather than foraging for it)…… Pesto sounds like a fantastic use for it (I would never have thought of that!)….. and not sure why freezing portions has never crossed my mind either! Thanks!!!! I got wild garlic for the first time in my veg box this week and have made some soup with it. Now I know what else to use it for! Haha, I got it in my veg box too, so promptly made yet another batch! Oh, you absolutely must Sarah, I imagine if you’re quick, you should be able to find some. Oh God I must get myself some wild garlic before it disappears , the nettles seem to have gone already ! I love garlic and adore wild garlic soup. I will definitely be freezing some wild garic pesto cubes for use later. Need to try this pesto with cheddar! Love the idea of freezing the cubes. I have a jar of pesto in the fridge, this now pales into insignificance!!! Haha. It actually freezes really well. I’m still addicted to pesto. What a great find! I have never come across wild garlic…but will keep an eye out for it now. Your pesto looks delicious! Thanks Amy. It grows pretty much all over the UK, so shouldn’t be too difficult to find. Well worth the effort.